Look smart and gorgeous in this smashing satin halter. It has a plunging neckline, and gathered effect at bust. Belt at waist, with square broach at center, giving an entire outfit a dazzling look. Extra fall in center front is for giving more grace to it. 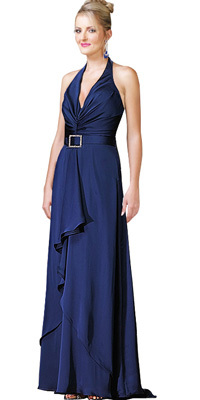 Sweeping drape and center back zipper are making it epitome of elegance.